Esoteric K-05 review | What Hi-Fi? It took just five seconds of Beethoven’s beautiful Moonlight Sonata for the Esoteric K-05 to show that it’s a brilliant disc player. In fact, it’s not strictly a CD player, as it’s capable of spinning high-resolution SACDs and has a full range of digital inputs too. Ordinary CD players tend to struggle with complex instruments like pianos, but the K-05 sets up a convincing three-dimensional acoustic space and plants the piano firmly in the middle of it. The instrument sounds harmonically rich, dynamically expressive and as solid as you like. Move on to SACD and things get even better. We listen to a range of discs, from a live recording of the Police to the large-scale and truly dramatic Carmina Burana, and the Esoteric doesn’t let us down. With the Police’s Roxanne, the K-05’s presentation positively brims with energy. There’s plenty of slam to the drums, not to mention the kind of rhythmic coherence most players – no matter how expensive they are – rarely hint at. There’s a real sense of drive here, and a superb ability to convey momentum. Sting’s vocals are as hard-edged as they should be, and cut through the hectic musical backdrop with ease. Carmina Burana lets the Esoteric show off its sonic authority and its ability to render a huge soundstage with class-leading precision. The sound is convincingly layered and displays an Everest-like stability even during the highly charged crescendos. It’s rare to hear this kind of composure, even from top-end machines. Listening to our range of SACDs makes us a little sad, too. It’s a shame this format didn’t gain true mass-market acceptance; through a quality machine such as the K-05 it can sound truly lovely, both delicate and relentlessly powerful at once, if required. There’s never a guarantee that a fine disc player will also make for a good DAC, but in this case, the Esoteric is a talented number cruncher too. The machine’s USB input can be configured in a number of ways, with differing compatibility and resolution limits. We went for the most capable option, which is asynchronous and supports 24-bit/192kHz data stream. Esoteric’s website has suitable driver software for Mac and PC users, and it takes only a few minutes to get everything up and running. The sound through USB – using an Apple MacBook as source – is excellent, retaining all the stability and composure we heard through the integrated disc transport. High-resolution recordings such as Mahler’s Symphony No.4 (24-bit/192kHz) and Dire Straits’ Brothers in Arms (24Bit/96kHz) are a real treat to listen to, delivering plenty when it comes to detail, dynamics and punch. The Esoteric’s sense of scale and composure are really obvious again, as is its neutral tonal balance. We’re also struck by the K-05’s bass clout. It’s rich and weighty without any sacrifice to precision and agility – a difficult balance that not many players get right. The story is similarly positive through the optical and coaxial inputs. Both can support 24-bit/192kHz data streams. If you like to tweak then you’re in for a treat. The K-05 has a range of digital filters – we preferred the one marked ‘S_DLY1’ (which has no pre-echo with an impulse function). It produced the most expressive and entertaining sound. The K-05 also lets you adjust the amount of upsampling that goes on internally. This is done in steps of double or quadruple the original source rate. The uncompressed PCM data stream can even be changed to DSD (Direct Stream Digital, the digital format on which SACD is based) before it reaches the digital-to-analogue converter if you want. There’s no technical reason to do this – but it’s another thing to mess about with if you fancy it. We tended to stick with the original sampling rate and avoided the DSD conversion after the first time we tried it. The sound seems so much messier with it on. The Esoteric’s excellent performance isn’t by accident. 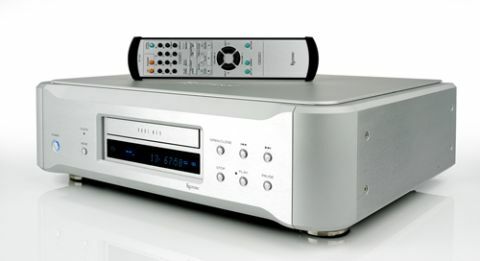 The company has an unrivalled pedigree as far as high-end disc players are concerned, and a careful look at the K-05 shows obsessive care in construction and design. Straight from the box it’s very clear that the K-05 is a thoroughly engineered piece of kit. It feels solid enough to make even a bank-vault feel insecure, and is finished to an impressively high standard, even considering that hefty price tag. The heart of this player is Esoteric’s deeply impressive VRDS-Neo VMK-5 disc transport. This is beautifully engineered, and works with deliberate chunky movements that speak of precision machining. The rest of this player’s design is packed with traditional high-end touches. We expect generously specified power supplies and carefully configured circuit boards packed with high quality components in a player like this, and we get them. Everything is geared towards maximising transparency and reducing distortion. The K-05 is without doubt a great machine, but it’s not quite flawless. It’s a little dim-witted in use and doesn’t respond to commands with the swiftness we’d like. Given a little patience everything works fine, though. There’s a small but growing trend towards using DSD music files, and it would have made sense to make this machine accept them through its USB input too. At the moment it doesn’t. Lastly, take a careful look at the decently hefty remote handset and you’ll see buttons for DVD replay. The K-05 can’t play DVDs. Explanation? The handset is used across a range of Esoteric products. We want a bespoke remote at this level. If you’ve spent years upgrading your hi-fi and are now in a position to buy your final disc-player, the Esoteric K-05 is a great place to start. It’s built to last a lifetime and sounds good enough to make us want to keep it that long. Yes, it’s expensive, but if you have a large disc collection and a decent library of music files the K-05 is sorely tempting.